Looking for a job? Join our Job Fair, it's got a few surprises that will superboost talent's game! WHub is excited to have the opportunity to hold another HK Tech & Startups Job Fair! 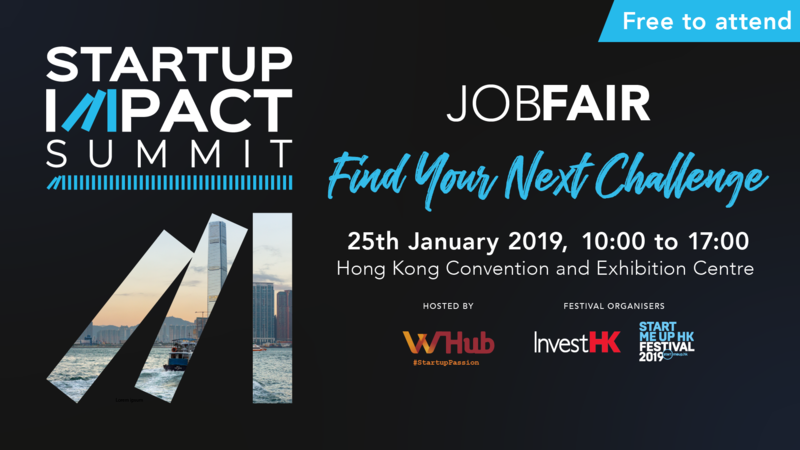 The HK Tech & Startup Job Fair #11 will bring together undergraduates, graduate students, and seasoned professionals to one event, exclusively for startups. If this sounds like you, register now! WHub's Job Fair is a part of Startup Impact Summit, organized by WHub. Startup Impact Summit the culminating last day of the StartMeUpFestival. The objective is to showcase impact created by startups and ecosystem stakeholders on the one side, and making more impact to startups and talent on the other side through workshops, mini-hackathons, a job fair, service market place, pitch stage, startup pavilions and booths. This includes connecting different ecosystems, not only within Greater Bay, but also from abroad. In addition, we are also showcasing an interesting line-up of speakers. We are particularly thrilled to have WHub and AngelHub presenting Jason Calacanis who is visiting and running one of his Angel university workshops for experienced and aspiring Angel Investors. Job Fair attendees can access only access the Job Fair which is free of charge. To get access to the Conference, please purchase the ticket here.